Brandon Whitaker scored his third touchdown of the game late in the fourth quarter and Anthony Calvillo threw over 300 yards for a CFL-record eighth straight game as the Montreal Alouettes defeated the B.C. Lions 30-25 on Friday night. 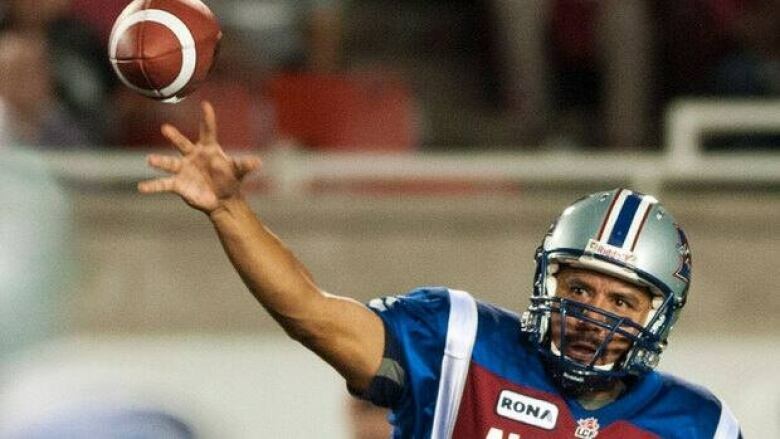 Another career milestone for Anthony Calvillo helped Montreal emerge victorious in a game between the Canadian Football League's two best teams. Calvillo threw over 300 yards for a league-record eighth straight game and Brandon Whitaker had three touchdowns as the Alouettes held on to defeat the B.C. Lions 30-25 on Friday night. The 40-year-old Calvillo completed 19 of 31 passes for 321 yards to break the record he shared with Doug Flutie. "That's pretty cool to just say that there's only one on top," Calvillo said. "At the end of the day, it's something that I'm always going to reflect on but it's just fun to get this huge victory." Whitaker put the Alouettes ahead for good on a two-yard run at 3:57 of the fourth quarter after catching a pair of touchdown passes from Calvillo earlier in the game. "B.C. 's got a great defensive line and I've got the best offensive line in the game, so it was a battle and we got just enough yards to get where we needed to go," Whitaker said. "As long as we got a W on our record, that's all that matters." Montreal's Billy Parker batted down B.C. quarterback Travis Lulay's third-down pass attempt from the 10-yard line as time expired in the final quarter. "We've had two or three games like that, that come down to the end of the game," Whitaker said. "It's stressful, but that's the CFL for you. And when you've got two good teams playing against each other, that's what you should expect." Montreal won its fourth in a row to improve to 6-3, first in the East Division. The Lions, who lead the West at 6-3, ended a four-game winning streak. B.C. will host the Alouettes next Saturday at BC Place Stadium. "Any time you lose to a team you always want to get right back out on the field and redeem yourself," Lulay said. "You don't often get that opportunity and we do this week. So that's how we have to view it, as an opportunity to go home and get right back in the saddle and find a way to overcome the play that we didn't make tonight." Arland Bruce III caught his second touchdown pass of the game to put the Lions up 25-24 at 6:28 of the fourth quarter. Lulay found Bruce alone in the back of the end zone for a seven-yard strike to cap a 56-yard drive that gave B.C. its first lead of the game. "You know it's going to be a hard-fought game and you almost expect it to come down to the wire like that," Lulay said. "I think it was a great job by us. We were down at half-time and we came back to take the lead and make it a new football game. You've got to believe that if you get three chances inside the 10-yard line you've got to find a way to get that done, and that's not to discredit them. That's just what you have to believe as an offence." Lulay finished the game with 275 yards passing and two TDs. His first touchdown pass to Bruce late in the first quarter extended his streak of consecutive games with a touchdown pass to 20. "Any time you do something like that, obviously you're not doing that by yourself," Lulay said. "That's a reflection of some pretty consistent offence over a period of time, being able to score at least one touchdown in every game, let alone it being a passing touchdown. "So that is a positive sign but we're fighting to win football games. It's not like we're trying to keep the streak alive. That's a streak that is kind of a byproduct of just trying to put points on the board." Victor Anderson scored on a five-yard run late in the third quarter for Montreal. Lions slotback Geroy Simon left the game with a hamstring injury. He did not return for the second half. The reigning Grey Cup champions stomped Montreal 43-1 in the last meeting between the two teams. The Lions sacked Calvillo four times in the lopsided Oct. 29 contest in Vancouver. B.C. 's Paul McCallum kicked three field goals on Friday, including a pair in the third quarter to draw the Lions even at 17-17. Calvillo completed four passes in a row to account for all 75 yards on the Alouettes' opening scoring drive. S.J. Green helped rack up 50 of those yards when he caught Calvillo's short pass and broke downfield. Calvillo and Whitaker connected on a 12-yard passing play for the opening touchdown 2:16 in. Bruce scored on a 10-yard touchdown pass to tie it 7-7 late in the first quarter. It was Lulay's 20th consecutive game with a touchdown pass. Whitaker's second touchdown reception of the game 10:10 into the second quarter was his fifth as a receiver this season.